Whatever type of RV you have—whether it’s a large motorhome or a small pop-up tent trailer—there is never enough space. It can be easy to bring too much and end up with a cluttered RV. 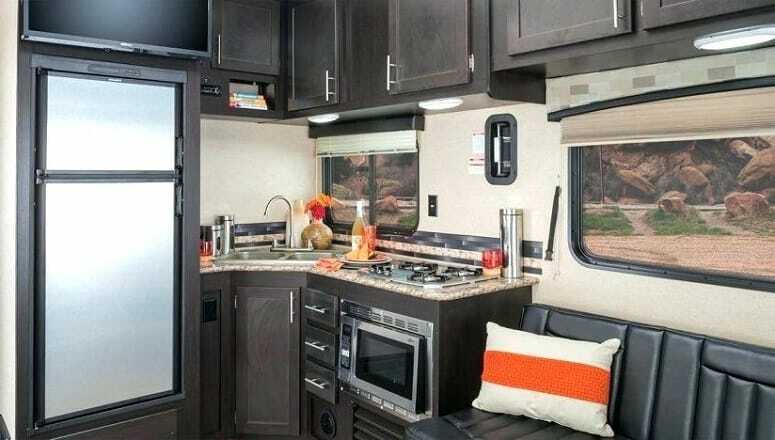 The kitchen is one area in almost every RV that tends to be a magnet for overcrowding. Kitchen appliances are an essential part of RV travel or living. Unfortunately, they can take up much-needed space. Many items that we consider to be necessities—from cookware to dish drying racks—are bulky. There are RV-friendly versions of more appliances than you might think. A microwave is one of those versatile appliances that’s hard to live without. When you’re on the road, microwavable meals can save a lot of time. Even if you prefer to cook meals from scratch, leftovers can be stored and heated up later in a microwave. Standard sized microwave ovens can take up counter space in your RV that you just can’t spare. It could be difficult to find a microwave that is both height and width appropriate for RV kitchens. And when you do find smaller models, many seem to have limited functions. Some don’t have frequently used settings such as defrost. Others may be lacking specific settings for certain foods or drinks, such as soup or popcorn. Ideally, you want a small microwave that can do everything that a big one can. After all, you don’t suddenly stop enjoying your favorite foods because you’re living in an RV. Check out this compact microwave oven from Toshiba which seems to have all the features you need. An extra benefit of this model is that you can turn off the alert sound. This allows you to use it without disturbing your traveling companions. Cooking in an RV can be a challenge. It is tempting to consider bringing along several appliances like a slow-cooker, a fryer and a rice cooker. Unless you have a palatial motorhome, this is usually a bad idea. These types of appliances are big, and hard to find space for. Multipurpose cookers are the ideal solution. Many of them can replace your slow cooker, and also fry, steam, boil, simmer and grill. The more meals you can prepare with a single appliance, the better. Failsafe mechanisms are important in general, but even more so when it comes to RVs. There should be safety mechanisms in place to ensure that the cooker doesn’t overheat or cause other issues. Try out this Instant Pot appliance. It comes in three sizes, depending on your needs. It does the work of slow cooker, pressure cooker, steamer, rice cooker, and more. You can even use it to prepare yogurt or reheat food. Full size blenders are often awkward to store in any kitchen. They are among the least RV-friendly appliances we can have. A great solution is a handheld combination blender. 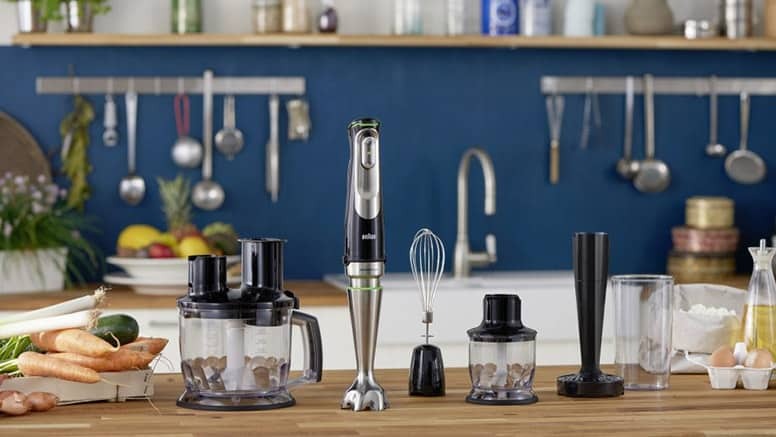 These are devices that combine a blender with other appliances, such as a food processor or whisk. They are small and lightweight, which makes them both portable and easy to store—perfect for an RV. As with other appliances on this list, you don’t have to sacrifice quality for size. You can find handheld blenders with more than one setting to fit all your needs. From smoothies to cake batter, you should be able to make it all. This handheld blender by OXA combines three appliances in one. You will be getting a blender, food processor and whisk. A mixing beaker is also included. Every RV owner learns to be aware of consuming propane on long trips. If you have a gas-operated stove and cook frequently, you could burn fuel at an alarming rate. 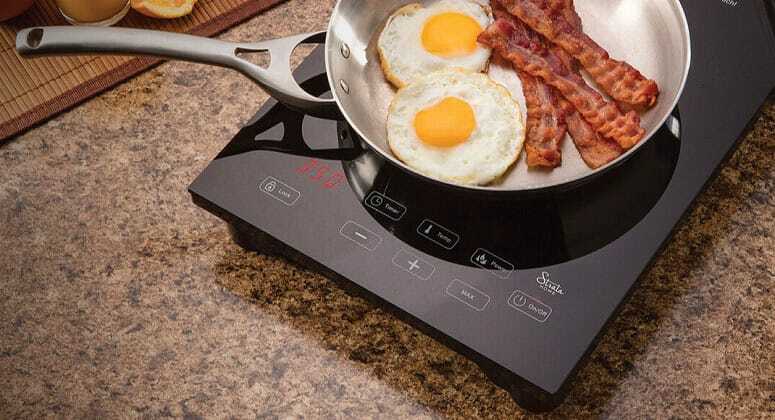 Induction cooktops can be used inside your RV or outdoors. They operate on electricity and are extremely efficient. Energy is conserved, as the heat output is based on the size of the cooking vessel. A bonus is that these cooktops tend to be light and portable. On the same note, induction cooktops are also much simpler to clean than a regular stovetop. As an added precaution for RV cooking, choose an induction cooktop with an automatic shut-off function. This will reduce the chances of burn-related mishaps. Take note that you cannot use just any cookware with these devices. Only stainless steel, cast iron or other magnetic metallic pots and pans will work. The Duxtop portable induction cooktop has 10 different temperature and power settings. It will also turn off automatically after one minute if not in use. Most of us enjoy a good cup of coffee or tea to start our day. Whichever your preference, you can rest assured there’s an appliance that’s perfect for your RV. Your RV is not the place for a big luxury coffee machine—leave that at home. Why not get a mini coffee-maker instead? Even if you have to make coffee several times to get your fill, the space you save is worth it. For most coffee drinkers, a standard miniature coffee machine will do the job. Keep practicality in mind—machines that require a lot of maintenance can be a nuisance, long term. You want your coffeemaker to be convenient to use and clean. The Mr. Coffee coffee maker does the job of a regular machine, but in a compact version. At just a little over three pounds, it can fit in even the smallest of RV kitchens. 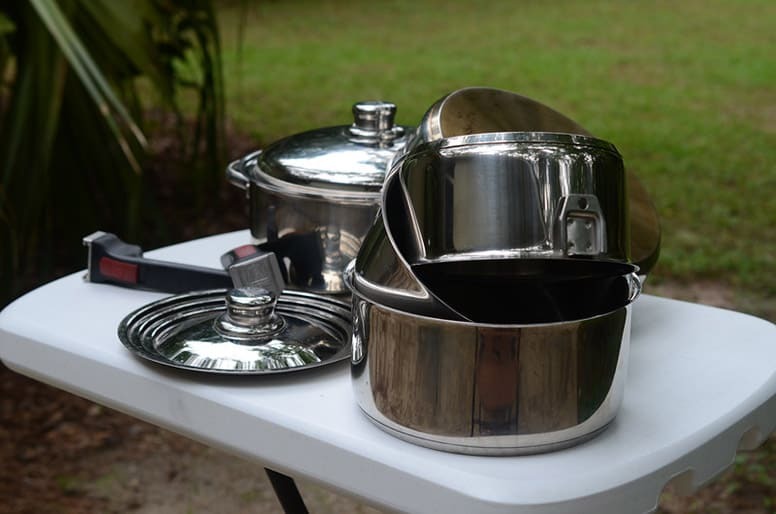 A kettle is one of the multipurpose appliances that is great for RVs. Boiled water can be used for anything from tea or instant noodles to cleaning. However, it can be tough to find space for your kettle when it’s not being used. Why keep a full-sized kettle on your counter when you can fold one away? Collapsible or foldable kettles are the way to go. 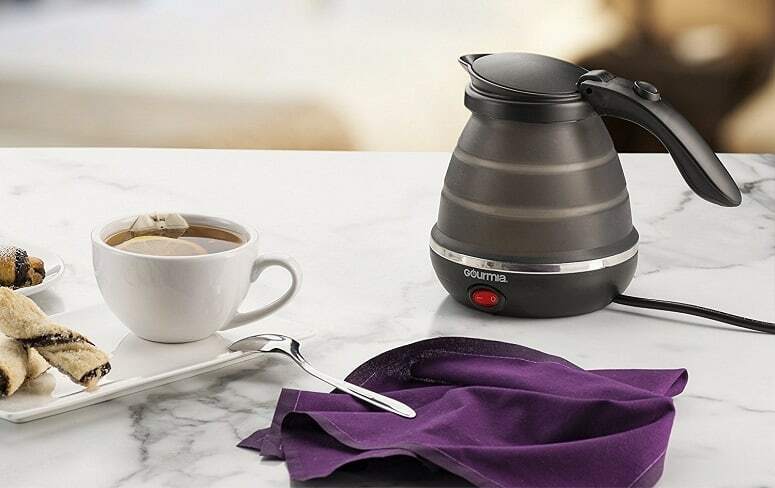 This portable electric silicone kettle by Gourmia can be folded away when not in use. It boils up to two cups of water at once. Nesting cookware is an ideal solution for cramped RV kitchens. Pots and pans notoriously take up a lot of space. Between the various shapes and sizes and their accompanying lids, they can be a storage nightmare. With a nesting cookware set, everything fits perfectly together. You can access whatever you need without hassle, while saving valuable shelf space. 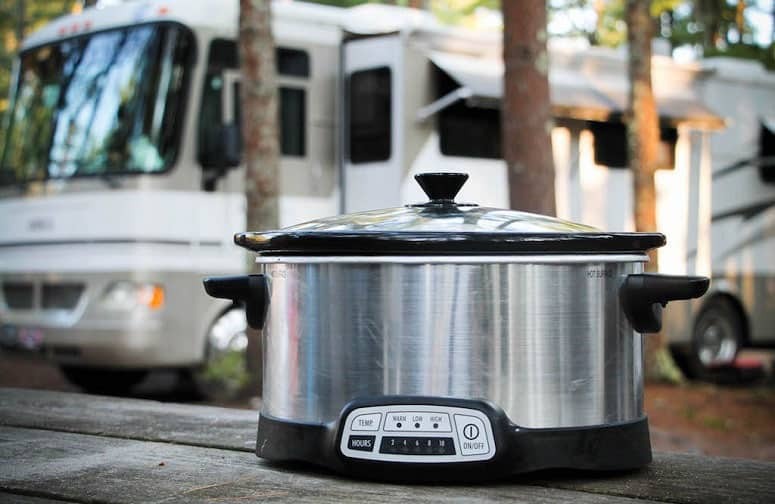 Think of the bare essentials needed to prepare most meals in your RV. Instead of having three frying pans of different sizes, use one. The same goes for pots and pans. For this reason, your nesting cookware pieces should be decently sized. You also want them to be easy to clean. Most RVs don’t have dishwashers—so choosing non-stick or stainless steel is in your interests. Not all nesting cookware sets are built alike. Look for sets that have options to remove handles. Make sure that the lids can nest inside the set too, and don’t have to be stored separately. The gourmet nesting cookware set takes up less than half a cubic foot of cupboard space. Made by Magma, the set consists of a frying pan, stock pot and saucepan, with lids and removable handle. A drying rack for your dishes can be annoying in a small kitchen, taking up precious counter space when you aren’t using it. The awkward shape makes it tricky to store in cabinets or cupboards that are already full. Fortunately, some dish drying racks can be collapsed or folded away. These racks should be just as functional as their non-collapsible counterparts. Material should be carefully considered. You certainly don’t want your rack to rust after a few uses. If the rack is covered in plastic, be sure that it is food grade and washable. There is nothing worse than a slimy rack covered in mildew. Always remember that multipurpose is best for RV kitchens. Look for racks that can be used for more than just drying. For example, a heat resistant rack can be very practical. You can set hot pots and pans on it to protect your counters or tables. After your meal is done, place it over the sink to drain the dishes. Certain racks can also be used during meal prep, such as for drying vegetables. 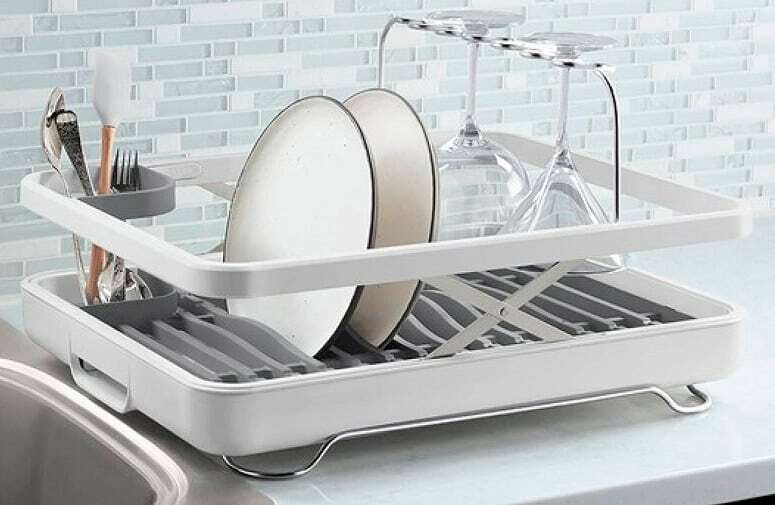 Surpahs’ dish rack is made with food-grade silicone-coated steel and is heatproof up to 400 degrees Fahrenheit. It can be rolled away for easy storage. An extra bonus is it comes with a lifetime warranty. Did any of these appliances catch your interest? I hope you found something on the list that helps improve your RV kitchen experience. Picking appliances that are suitable for RV kitchens is not just about size. An item can be small or collapsible but should also be easy to use and of high quality. If an appliance combines several uses in one, all the better. 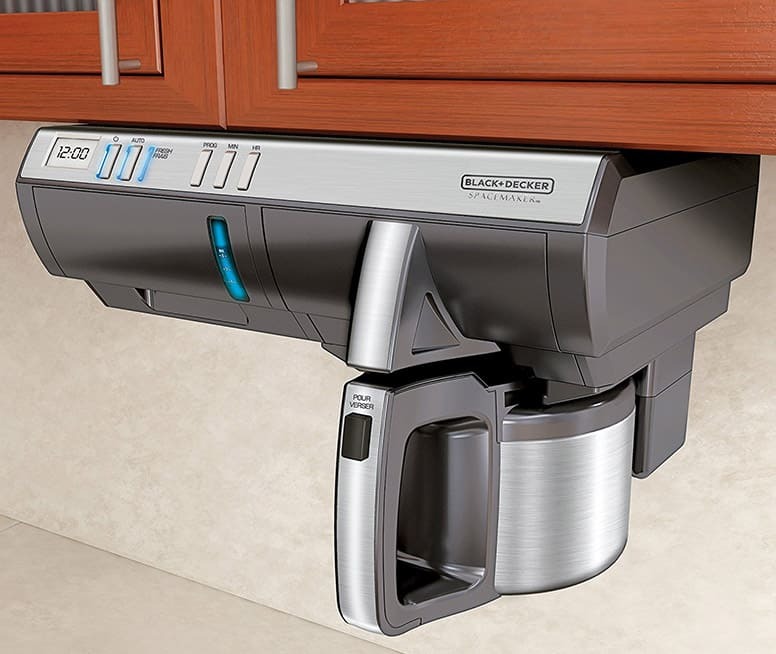 Are there any other appliances you think are RV kitchen must-haves? Tell us all about them in the comments. Share this article with friends or family looking to save space or upgrade their RV appliances.